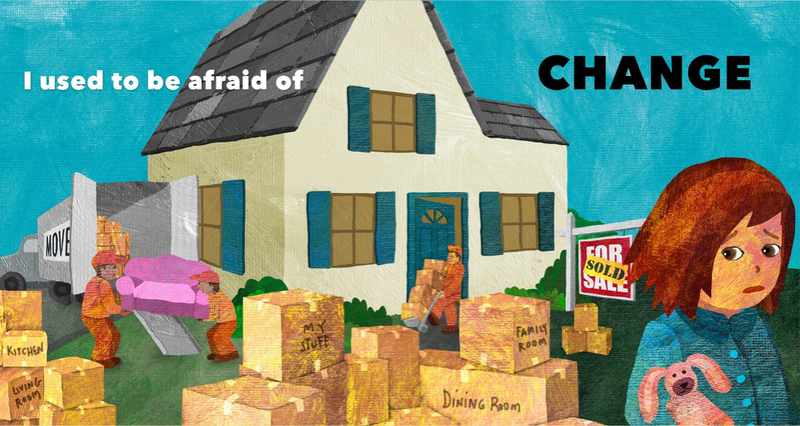 Fear is a common occurrence during the developmental years of children. In a positive sense they allow for an understanding of the causes of chronic consternation that will usually lead to dissipation. Kids in the most impressionable stages are frightened of the dark, monsters, animals, insects, germs, thunderstorms, loud noises, illness, vertigo and others concerns, but they are almost never sustained for a substantial period of time. To be sure many adults maintain an unending fear of heights, claustrophobia and even arachnophobia, and they have been the subjects of novels, films and television shows. Jimmy Stewart’s police detective “Scotty” Ferguson in Hitchcock’s Vertigo carried a lifelong affliction of the condition, and Night Gallery’s “A Fear of Spiders” featured a middle aged man who was terrified of the insects. 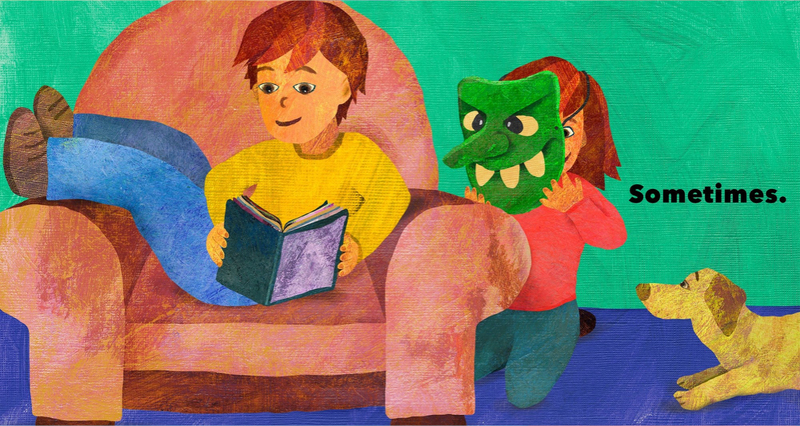 There can be little doubt that the nurturing of these fears at the youngest ages by attentive parents can curb some of the growing symptoms, usually by showing that the object of fear shouldn’t be isolated, but rather integrated with their environment or in the case of phobias with a broader perception of how how this intimate fear is lessened when perceived in a broader canvas. 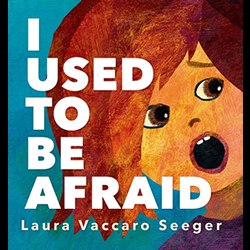 The young girl in Laura Vaccaro Seeger’s I Used to Be Afraid got over the vast majority of her own shuddery inhibitions by departing the sphere of intimacy that invariably pitted her one-on-one with the object of her dread. 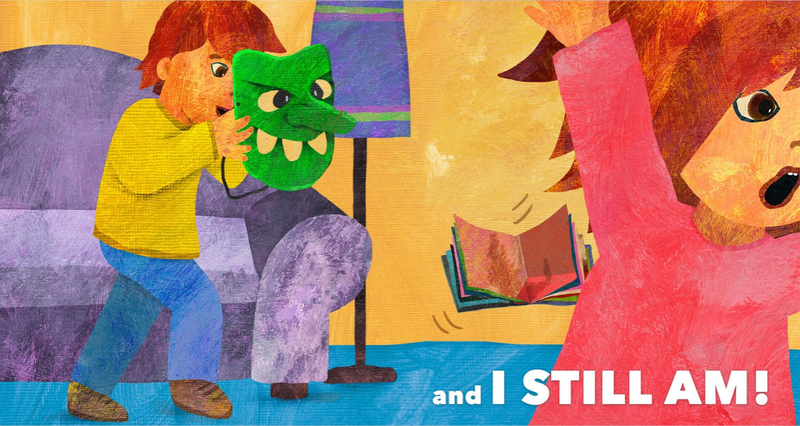 Seeger, the two-time Caldecott Honor winner of First the Egg and Green and author of another rightly-acclaimed title, Bully, is a die-cut artist extraordinaire, and her minimalist employment of this style in her latest book as always brings page-turning dividends that alter the thrust of the previous tapestry. Seeger’s lush and wholly exquisite application of acrylic paint and collage make for a colorfully immersive aesthetic experience to sit alongside the surprises in store for readers. The opening end papers depict our unnerved protagonist hiding behind a couch, as the family dog shows a pointed degree of concern. 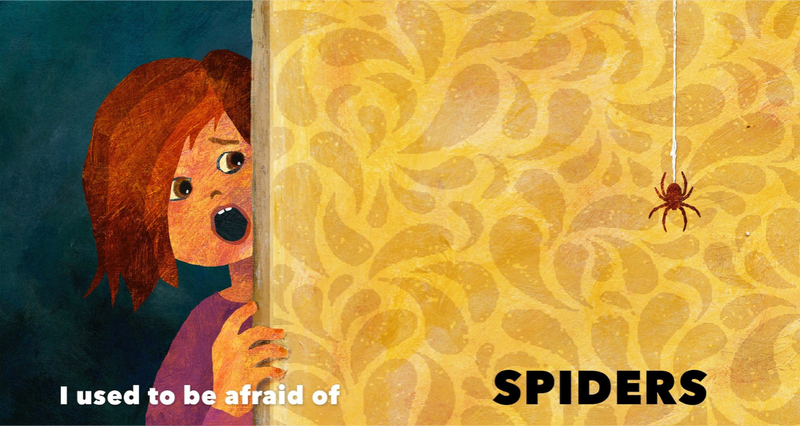 The wide-eyed, open-mouthed girl announces “I used to be afraid of spiders” looking out from behind a door to observe a spider hanging down from a string. The panel is dominated by a splendid yellow floral design, but that eight-legged die cut spider portends some intrigues which end with an expansively beautiful depiction of a multi-dimensional spider web standing out from a stunning aquamarine base. The contented girl is seen behind it, with spider now part of a system instead of a lone specter, with the words “but not anymore” to denote the metamorphosis. The next lesson to be learned in an unwitting homage to Seeger’s Green, as our reformed young lady holds her hands over her face, not wanting to look at her own imposing shadow on the wall. The introductory words are “I used to be afraid of Shadows,” while the larger die cut of the shadow takes on a most congenial role after the page turn, blending in with a different shadow, that of the girl’s hand shaping of heart. She knows now that shadows can ape something wonderful too. 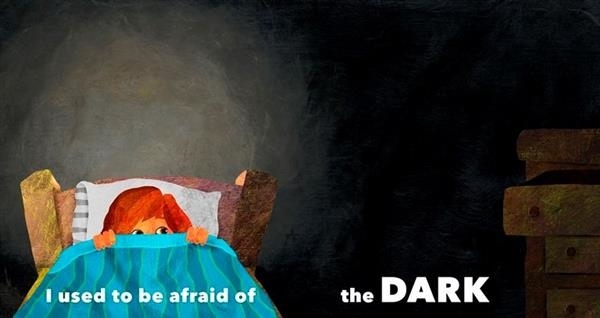 Next up: “I used to be afraid of the Dark” is an encapsulation of some recent (and exceptional) picture books that have expanded on the subject: Lemony Snickett and Jon Klassen’s The Dark and Mac Barnett and Christian Robinson’s Leo: A Ghost Story. Our girl is obviously frightened of the concept of dark and how it is all-enveloping as she sleeps with only her stuffed bunny alongside her. However, the circular die-cut promises more than a measure of comfort, as it turns into a bluish moon in full atmospheric kinship with a starry sky. The lesson learned here is that the dark allows for nocturnal illumination, a gleeful realization as girl and dog sit outside looking into the heavens. “I used to be afraid of making a mistake” (the letter ‘s’ inverted) on a lined journal navigated with hands holding colored pencils, but then our errant die cut turns into a multi-colored confirmation of the corrected word, ushered in with happy floral adornments. Echoing the potentially cathartic experience of moving away from friends and routine (both Deborah Underwood and Jonathan Bean’s Good Bye Bad Bye and this year’s Yard Sale by Eve Bunting and Lauren Castillo examined this most impressively) Seeger states the dilemma in the general manner even the youngest kids would understand: “I used to be afraid of change” and showing a sold home and the moving man carrying furniture and boxes onto a truck, observed by a tearful girl. When the die cut highlights “My stuff” as she holds her beloved bunny, she realizes that change is nothing more than a state of mind, and that the things that matter most to her will not be left behind. Seeger doubles the ante on the book’s design in regard to the matter of being alone, which is chartered on the field, outside a school bus, again on the field but in solitary terms, and then by a tree where the girl realizes that when one has books they are never alone. 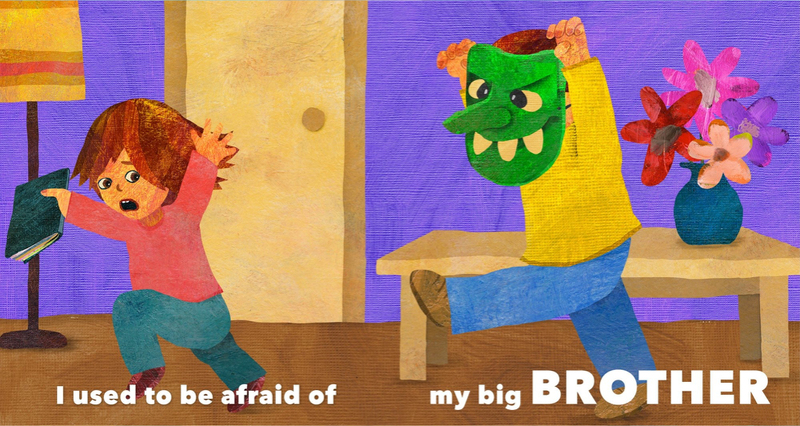 Yet with overriding reform there are still some tough nuts to crack, and a big brother with a mask remains menacing. Yet there are chances to turn the tables, and Seeger envisions this and the familial-charged final end papers with affectionate bravado. The alluring cover boldly denoting the girl’s fear is fantastic. I used to Be Afraid is another of Seeger’s themed works that invites all sorts of classroom activities, including the obvious one asking students to draw something they fear. Seeger has traveled down the Caldedott path successfully on two occasions, and this new gem should be solidly in the discussion. Note: This is the twenty-seventh review in the 2015 Caldecott Contender series that will be published at this site over the coming months, up until the January 11th scheduled awards date. The books that will be examined are not necessarily ones that are bonafide contenders in the eyes of the voting committee, but rather the ones this writer feels should be. The order they will be presented is arbitrary as some of my absolute favorites will be presented near the end. Brilliant review Sam. Just astonished at the pace you are churning them out, without the loss of even an ounce of quality. This themed book is no doubt a big favorite with kids. Thanks so much Frank! I certainly can attest to its popularity in the classroom, as I’ve used it. Sam — GEM, indeed. Universal, this book is something we can ALL relate to! Laurie, the premise of this book will of course appeal to all children, and from the experience of using it in the classroom it hooks them in from the very first page. Thanks as always my friend.